I install a copy of Macrium Reflect Workstation and when a try to use viBoot, the backup option is absent. Thanks for posting, the backup option was removed from the viBoot interface due to a potential issue with branching of backup sets. We are in the process of reinstating this function. I cannot provide an ETA for delivery at this time. Can I make another question? If I use Macrium to make a backup of the System running on the Hyper-V, the disc structure (MBR, GPT, UEFI) change? Can I use this to update the system anda programs of my backups? Are you asking about running Reflect from inside the VM itself? If you do that, the disk structure doesn't change compared to the original system that the viBoot VM was created from, but I'm not sure what you mean by asking about "updating the system and programs of your backups". However, viBoot isn't really meant to be used as a long-term solution where you should need to be running Reflect from inside the VM, and in fact if you use a viBoot VM long-term and also keep using the original system that the VM was created from, that would probably create software licensing problems for both Windows and Reflect. viBoot is primarily meant for verifying that an image backup is bootable and also as a disaster mitigation solution because it gives you a way to start a system up from a Reflect backup even if the original system is dead. In the latter scenario, the idea is that if your original system goes down, you can use viBoot to start it up as a VM somewhere else until you fix or replace the original system. 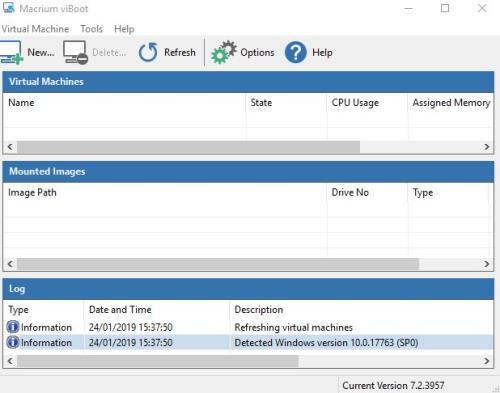 Then you could use Reflect running from the host system (not from inside the VM) to capture a new backup that would include any changes that occurred while the VM was running, and then you restore that backup onto the original system (or its replacement) when that system is able to be used again. Are you asking about running Reflect from inside the VM itself? If you do that, the disk structure doesn't change compared to the original system that the viBoot VM was created from, but I'm not sure what you mean by asking about "updating the system and programs of your backups". I Want to start the VM update th operational system (Windows 10) and programs and then make a backup using Macrium. I Understood your explanation.I was making a wrong use of the software. Hmm, ok. Well that's not the main "advertised" use, but testing an operation like that in a VM created from your system before trying it on your actual system is certainly something viBoot can be used to do. So I would say go ahead and try it. I make a few trys and some macrium backuks wont boot. I think in your explanation and come back to Vmware, for a while. Without knowing more it's tough to troubleshoot, but make sure your backups include all of the necessary partitions to boot Windows. Some people back up only their C drive, which on many systems isn't enough on its own to be bootable in a VM, and if you ever tried to restore that backup onto an empty hard drive in your real system, it wouldn't be bootable either. In Reflect under the Backup Tasks column along the left edge, there's an option that says something like, "Create an image of the partitions required to back up and restore Windows". Click that and make a note of which partitions are pre-selected in the wizard that appears. Any backups you make with the intent of being able to viBoot or restore your system should include at least all of those partitions. The other possibility is that if your image is Windows 7 and is booting in UEFI mode (from a GPT disk), you won't be able to viBoot those images because of a Hyper-V limitation. Windows 7 is typically set up to boot in Legacy BIOS mode (MBR disk) because even in UEFI mode it has some Legacy BIOS dependencies, and Hyper-V's Gen 2 VMs that support UEFI don't allow any of those dependencies. So to boot Windows 7 on viBoot/Hyper-V, it needs to be from an MBR disk that uses a Gen 1 VM to boot in Legacy BIOS mode. viBoot/Hyper-V only support booting Windows 8 and newer in UEFI mode (and some other non-Windows OSes). I always use the option "Create an image of the partitions required to back up and restore Windows". All my backups are of Windows 10 Systems. Each one with programs and the OS updated. When the problem of a PC/Notebook of the customer is not possible to resolve or when I sell a new machine, I use one of them. My idea was update this backups without need to restore them to a physical machine. I do this today using VMware. I use macrium inside VM to backup the updated System. But if was possible to do this with viBoot, the process was much more simple. Sorry my bad English and thank you for your efforts to help me.